Central American Wood Turtle (Rhinoclemmys pulcherrima manni) is a turtle species of which a number of species and subspecies come from Central America, with a distribution range from Mexico to Northern Ecuador and Northern Brazil. It lives on the savannahs, in forests and on riverbanks. The distribution area of the subspecies Rhinoclemmys pulcherrima manni is restricted to the northwest of Costa Rica and the south of Nicaragua. There is a variation in length within the genus of 12 to 32 cm. Males are smaller than females and have longer tails. The habitat area of Central American Wood Turtle is situated between 10-13 degrees N.L. and could be described as dry tropical woods, it is a low-lying area (0-1000 m) with annually 1500 mm rainfall, this is dry for Central America. They range between Sonora, Mexico, and Costa Rica. They are semi-aquatic and live along forested rivers and streams, usually in cool, upland areas of deciduous woodland, marshy meadow, red maple swamp, and farmland habitats. Although Central American Wood Turtle is an omnivore, this does not mean that all food is suitable. The animals will eat insects, worms, snails, nest mice and to a lesser extent meal. Uncooked shrimp and small parts of freshwater fish are also valuable food additions. Furthermore all sorts of green food given to land turtles form the basis of their daily meal and should be at least 80% of the whole food packet. Examples are; dandelions, broad-leaf and lance-leaf plantain, clover, vetch, dead nettle, shepherd’s purse, stinging nettle and other herbs which have a well balanced phosphor-calcium ratio and should be fed as varied as possible. After mating, a female will lay a clutch of 4 eggs. They prefer to lay the eggs in a moist, protected area. The eggs measure 24-32 mm x 37-52 mm. Hatchlings measure from 35 to 50 mm in carapace length. The eggs are buried carefully, and the female camouflages the nest, then departs, and protecting to her offspring, because they may not reproduce every year. In building an inside enclosure, people should think of this important things: a densely covered river bank biotope, of course with high humidity and some basking points where the turtles can warm without leaving their places. Also, some cooler places where animals can dig in and stay out of sight and the sun. About the minimal measurements for the enclosure one can say very little. 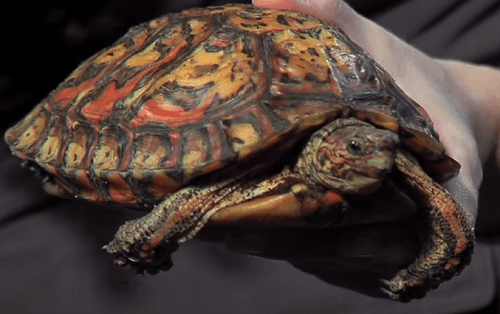 Central American Wood Turtle is best kept in a terrarium on a 10-15 cm thick layer of moisture keeping substrate, with a basking spot producing temperature of 35-40ºC. Especially during colder rainy days, this is a must. Transparent fences are not recognized by the animals, the turtle will constantly try to brake out, which can lead to stress and disease. Furthermore, the place of the outside enclosure should be chosen in such a way that there will be sunshine for most of the day.